This looks nothing like Mario. Zelda MAYBE. And in Zelda, you have to find 4 heart pieces, or a whole heart. Or refill what you have with tiny hearts that float to the ground. Clearly, hearts are depicted here, not lives(or men). Hearts do not equal lives. The difference being that once hearts are depleted, a life will be used up, not vice versa. @Pants: More like Zelda. amirite? A very nice design on a Threadless t-shirt. @rompSku: sure zelda but it doesnt use coins, and i never played it much so it didnt come to mind, but certainly not sonic? Haha your comments made me laugh. Ever thought about the possibility that this wasn’t supposed to look like it’s from a certain game? They just made it look 8 bit-ish to give it a traditional video game feeling. I have and love this shirt. 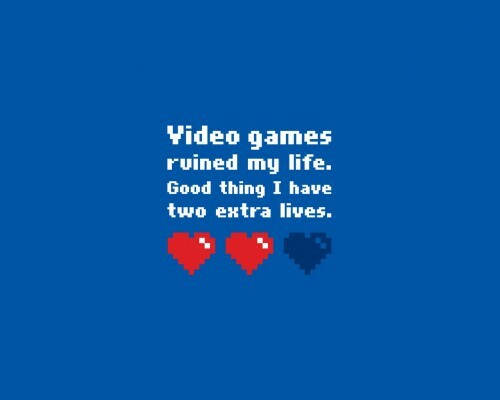 It’s my favorite gaming shirt simply because it’s non-specific. And awesome.